With calls by containerships with slot capacities of between 14,000 and 17,999 TEU increasing by 36.9 percent to 167 and those by even larger vessels (18,000-20,000+TEU) up by 87.8 percent at 77, the number of particularly large containerships seen in the Port of Hamburg further increased. Making maiden calls, among the latter were mega-carriers MOL TRUST with slot capacity of 20,170 TEU and MUNICH MAERSK (20,568 TEU). Both Joint CEOs see the inability of mega-containerships to call and leave Hamburg optimally loaded on account of the still outstanding adjustment of the Elbe fairway as the main reason behind only slight growth in container traffic. ‘Adjustment of the fairway is essential for Hamburg and should at last be put into effect. Higher draft and improved opportunities for passing on the Elbe will offer increased safety and flexibility for traffic control on the Elbe, also producing tremendous advantages for merchant shipping. Mega-containerships will be able to bring/take away an additional 1,600 and more containers (TEU) per call to/from Hamburg,’ explained Ingo Egloff, Joint CEO of Port of Hamburg Marketing. 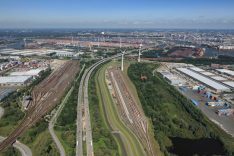 For both CEOs of Port of Hamburg Marketing, it is not acceptable that vital infrastructure projects like the adjustment of the fairway on the Lower and Outer Elbe should be blocked by objections from environmental pressure groups and others. The delays involved are meanwhile barely calculable. ‘It is becoming increasingly difficult for us to explain to the port’s international customers how we are still having to wait for implementation of fairway dredging despite the qualified planning approval granted in 2012 and the February 2017 decision of the Federal Administrative Court. The fact that the bodies objecting also seemingly continue to pursue the aim of a final rejection of the dredging of the fairway also deserves criticism. In doing so, they wholly ignore the damage to the national economy caused by a blockade that has already lasted years and the additional adverse economic effects on the further development of the port and the jobs involved,’ commented Egloff.